40 Years Diving Beautiful Bonaire! Look What Happened this Year! When Rec Diving chartered the first jet to land at the Bonaire airport back in 1977, we had already been enjoying the world-class Caribbean diving there for several years. During our very first official year in business, Bonaire became a go-to destination on our annual Rec Diving group trip list. It remains one of our favorite spots today, 40-years later. We celebrated the century dives of three awesome, accomplished Rec Divers, John, Meghan and Erin…hip, hip, hooray! We cheered on new Junior Rec Diver Ari, who successfully completed her Open Water Certification dives…woohoo! We were honored by the Bonaire Department of Tourism for Rec Diving’s 40-years as Bonaire Ambassadors…yay! Rec Diving founder, Mike Kohut, reflects on Bonaire – then and now! And we share some of our favorite highlights from our latest trip to Bonaire. Enjoy! https://www.recdiving.com/wp-content/uploads/2016/04/Cropped-Bonaire-Group-870x350.jpg 350 870 Diane Richards https://www.recdiving.com/wp-content/uploads/2017/09/RecDiving_logo.jpg Diane Richards2015-01-18 10:39:592017-09-19 18:59:2740 Years Diving Beautiful Bonaire! Look What Happened this Year! How do You Pack ALL that Dive Gear? 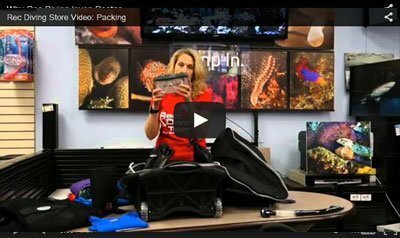 https://www.recdiving.com/wp-content/uploads/2015/01/How-do-You-Pack-ALL-that-Dive-Gear-.jpg 238 400 Diane Richards https://www.recdiving.com/wp-content/uploads/2017/09/RecDiving_logo.jpg Diane Richards2015-01-15 13:20:032017-09-20 05:08:00How do You Pack ALL that Dive Gear? That’s right, FREE Bench Tests NOW until the end of this month. Stop by with your BC, Regulator, Alternate Air Source and computer or gauges. We will give it a Bench Test while you wait to check for any problems. A great idea especially if your getting ready for a dive trip. If your gear checks out o.k., you’ll be on your way with some peace of mind. If it needs to be serviced, we will schedule it in.